Having founded my startup a few years ago, I am familiar to why founders go through the pain & grit to build their own company. The statistics around startup survival rates show that the risk is high, but the potential reward both financially & emotionally is also significant. In my case, risk was defined by the amount of money I invested in the venture plus the opportunity cost in case the startup goes nowhere. The later relates to the fact that I earned no salary at the beginning & that when I committed to that specific idea I was instantaneously saying “no” to many other opportunities and potential career advancements. The reward was two-fold too; the first one was the attractive financial outcome of a potential exit. The second one was the freedom to chase opportunities as they appear, doing what I want and how I want it. Once I raised capital from investors, I basically traded reward for reduced risk. I started paying myself a small salary and anticipated that more resources would increase the success likelihood of the startup. This pattern of weighing risk against rewards was crystal clear in my mind… until I joined the arena of corporate venture building. Directly during one of my first projects, I was tasked with the creation of a startup for a blue-chip corporate client. I was immediately puzzled by the reasoning behind this endeavor. Ultimately corporate decisions are also guided by risk against reward: if they don’t take risks and innovate they might be left behind and, in some cases, join the once-great-now-extinct corporate hall of shame. That’s why they invest in research and development, spend hard earned cash in mergers and acquisitions and start innovation programs. But my interest was more at a micro level, meaning, which reasoning my corporate client follows to decide if and how to found a specific new venture? 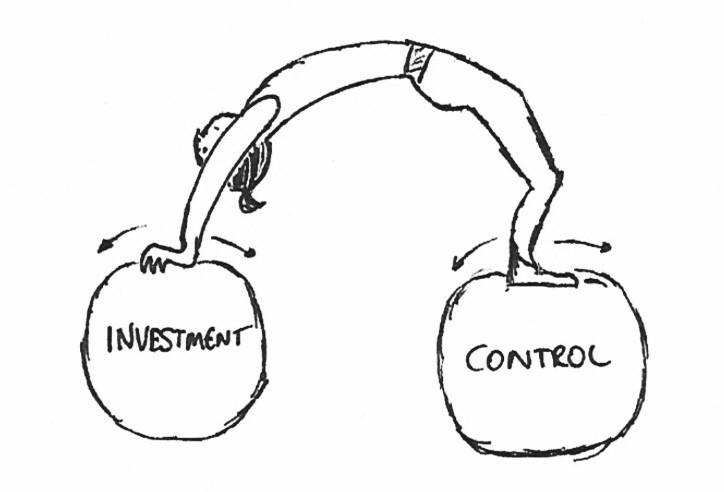 Having thought about it a lot, I believe at micro level corporates weigh investment against control. Investment is the level of capital, manpower & political will provided by the corporate to propel the venture towards exit, break-even or strategic relevance. Control is the possibility to steer the venture towards the strategic goals the leadership team has in mind while defining the boundaries of what can & cannot be done. In the startup case, the risk/reward is typically shared between the founders and external investors. In a corporate venture building case, the investment/control can be shared between the corporate, an empowered founder team and also external investors. Based on that, three main scenarios are being considered to found the new venture. Per definition, the incubation and acceleration stages are less capital intensive and is the moment when key strategic decisions that shape the future business are made. In these stages, the corporate is interested in maintaining the full control of the venture while absorbing the whole investment. Only when they enter the capital-intensive growth stage it becomes necessary to “share the burden” with other institutional or strategic investors. This scenario is suitable for ventures of high strategic value, especially the ones leveraging core assets and know-how of the corporate mothership. In this case, the corporate initiator empowers a founder team and joins the project almost like an external investor would do at Seed and Series A of a startup. They agree on a broad vision, provide the funding and retain a part of the shares with shareholder meetings in between to track progress. Beyond that, they let the founder team do their thing. External investors can join at any funding round to share the investment tickets. The corporate would have lower control and investment from the get-go and can increase their influence only when new funding rounds are required or via an acquisition offer. This scenario is suitable for ventures in which the corporate can function as the first client or use their network to manufacture, market or distribute the product or service. The venture is initially built by a founder team or external partners (often a consultancy). Only once they successfully finalized the incubation and acceleration stages, the corporate has the right or obligation to absorb the business. Differently than scenario 2, the corporate gains stronger control of the trajectory of the business during its initial stages by defining how a “transfer” event looks like. The investment necessary to put together a strong founder team is reduced by the reward of a pre-defined & short term exit event. The initial investment can be further reduced by the participation of Business Angels, also motivated by a clear path to exit and access to a new source of deal flow. This scenario is suitable for ventures closely linked to the core business of the corporate and where speed & excellence of execution is key. Many of you have seen the Gartner Hype Cycle curve. When a hot technology appears, it gets hyped and hyped until one day enough people become impatient, and sentiment turns against the technology. It then heads into what Gartner calls the Trough of Disillusionment. Eventually, the technology finds its role – often a major one – in the market. The idea has always struck me as rather obvious (I described the curve to reporter colleagues on the tech beat at the Wall Street Journal years before I ever saw the Gartner chart), but Gartner popularized the notion, which is why it’s known as the Gartner Hype Cycle rather than, say, the Carroll Hype Cycle. Gartner is to be commended, because technologies can be plotted on the curve, and, drawing on history, their futures can be predicted with some confidence. On the Carroll…er, Gartner Hype Cycle, the idea of technology-driven innovation in insurance seems to be heading into the Trough of Disillusionment (great name) among incumbents. A Lemonade or Trov hasn’t taken over the world. Big Tech is coming to insurance but not really here yet for most insurers. Industry executives seem to have read everything they care to about AI, blockchain, etc., and are starting to describe plans for small-bore improvements rather than truly innovative ones. Not total disillusionment, but headed in that direction. Which brings me to the warning signs for 2019. The slide into the Trough of Disillusionment creates real opportunities because prices of insurtechs will start to settle back toward reality. In any case, technologies keep maturing, no matter how we feel about them, so the day of reckoning in the market creeps closer all the time, and the slide toward disillusionment is the last opportunity for companies to position themselves before a host of technologies and startups will shake the insurance market. You set up an innovation fund and think that means you’re innovative. Your innovations focus on cutting expenses, to the exclusion of all else, and – worse – you reward executives based on those cuts. You say your legacy IT systems are what is preventing you from innovating. You say your defensive culture is preventing you from innovating. You have 6,000 ideas but can’t figure out how to turn one into a product. You can’t name 20 insurtechs that operate in your strategic domain or adjacent ones. You aren’t starting to move your operations into the cloud. You don’t have significant diversity in your management team and board, in terms of gender, race, age and nationality. You can’t quantify and measure how you’re doing on your innovation journey and hope you’re improving. Bonus warning sign: You make television commercials criticizing innovative companies. In “The Sun Also Rises,” a character is asked how he went bankrupt. “Two ways,” he says, “gradually, then suddenly.” We’re still in the “gradually” part of innovation driven by insurtech, but “suddenly” is coming. I suggest insurance industry incumbents view 2019 and warning signs like these as a last warning to get moving and avoid innovation bankruptcy. Digital health innovation continues moving full-force in transforming the business of healthcare. For pharma and medtech companies in particular, this ongoing shift has pushed them to identify ways to create value for patients beyond the drugs themselves. From new partnerships between digital health and life science companies to revamped commercial models, collecting and extracting insights from data is at the core of these growth opportunities. But navigating the rapidly evolving terrain is no simple task. To help these companies effectively incorporate and utilize digital health tools, Rock Health partner ZS Associates draws on over 30 years of industry expertise to guide them through the complex digital health landscape. We chatted with Principal Pete Masloski to discuss how he works with clients to help identify, develop, and commercialize digital health solutions within their core businesses—and where he sees patients benefiting the most as a result. Note: This interview has been lightly edited for clarity. Where does ZS see the promise of data- and analytics-enabled digital health tools leading to in the next five years, 10 years, and beyond? Data and analytics will play a central role in the digital health industry’s growth over the next five to ten years. Startups are able to capture larger, novel sets of data in a way that large life science companies historically have not been able to. As a result, consumers will be better informed about their health choices; physicians will have more visibility into what treatment options work best for whom under what circumstances; health plans will have a better understanding of treatment choices; and pharmaceutical and medical device companies will be able to strategically determine which products and services to build. We see personalized medicine, driven by genomics and targeted therapies, rapidly expanding over the next few years. Pharmaceutical discovery and development will also transition to become more digitally enabled. The ability to match patients with clinical trials and improve the patient experience will result in lower costs, faster completion, and more targeted therapies. The increase in real-world evidence will be used to demonstrate the efficacy of therapeutics and devices in different populations, which assures payers and providers that outcomes from studies can be replicated in the real world. How is digital health helping life sciences companies innovate their commercial models? What is the role of data and analytics in these new models? The pharmaceutical industry continues to face a number of challenges, including the increasingly competitive markets, growing biosimilar competition, and overall scrutiny on pricing. We’ve seen excitement around solutions that integrate drugs with meaningful outcomes and solutions that address gaps in care delivery and promote medication adherence. Solving these problems creates new business model opportunities for the industry through fresh revenue sources and ways of structuring agreements with customers. For example, risk-based contracts with health plans, employers, or integrated delivery networks (IDNs) become more feasible when you can demonstrate increased likelihood of better outcomes for more patients. We see this coming to fruition when pharma companies integrate comprehensive digital adherence solutions focused on patient behavior change around a specific drug, as in Healthprize’s partnership with Boehringer Ingelheim. In medtech, digital health tools can both differentiate core products and create new profitable software or services businesses. Integrating data collection technology and connectivity into devices and adding software-enabled services can support a move from traditional equipment sales to pay-per-use. 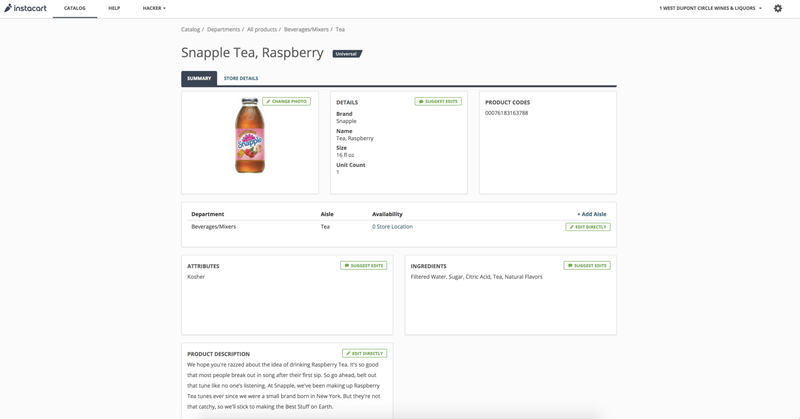 This allows customers to access the new equipment technology without paying a large sum up front—and ensures manufacturers will have a more predictable ongoing source of revenue. That said, data and analytics remain at the core of these new models. In some cases, such as remote monitoring, the data itself is the heart of the solution; in others, the data collected helps establish effectiveness and value as a baseline for measuring impact. Digital ambulatory blood pressure monitors capture an individual’s complete blood pressure profile throughout the day, which provides a previously unavailable and reliable “baseline.” Because in-office only readings may be skewed by “white coat hypertension,” or stress-induced blood pressure readings, having a more comprehensive look at this data can lead to deeper understandings of user behaviors or conditions. Continuous blood pressure readings can help with diagnoses of stress-related drivers of blood pressure spikes, for example. These insights become the catalyst for life science companies’ new product offerings and go-to-market strategies. What are some examples of how data sets gathered from partnerships with digital health companies can be leveraged to uncover new value for patients and address their unmet needs? As digital health companies achieve a certain degree of scale, their expansive data sets become more valuable because of the insights that can be harnessed to improve outcomes and business decisions. Companies like 23andMe, for example, have focused on leveraging their data for research into targeted therapies. Flatiron Health is another great example of a startup that created a foundational platform (EMR) whose clinical data from diverse sources (e.g., laboratories, research repositories, and payer networks) became so highly valued in cancer therapy development that Roche acquired it earlier this year for close to $2B. It’s exciting to think about the wide array of digital health solutions and the actionable insight that can be gleaned from them. One reason partnerships are important for the industry is few innovators who are collecting data have the capabilities and resources to fully capitalize on its use on their own. Pharma companies and startups must work together to achieve all of this at scale. Earlier this year, Fitbit announced a new partnership with Google to make the data collected from its devices available to doctors. Google’s API can directly link heart rate and fitness activity to the EMR, allowing doctors to easily review and analyze larger amounts of data. This increase in visibility provides physicians with more insight into how patients are doing in between visits, and therefore can also help with decision pathways. Another example announced earlier this year is a partnership between Evidation Health and Tidepool, who are conducting a new research study, called the T1D Sleep Pilot, to study real-world data from Type 1 diabetics. With Evidation’s data platform and Tidepool’s device-agnostic consumer software, the goal is to better understand the dynamics of sleep and diabetes by studying data from glucose monitors, insulin pumps, and sleep and activity trackers. The data collected from sleep and activity trackers in particular allows us to better understand possible correlations between specific chronic conditions, like diabetes, and the impact of sleep—which in the past has been challenging to monitor. These additional insights provide a more comprehensive understanding of a patient’s condition and can lead to changes in treatment decisions—and ultimately, better outcomes. How do you assess the quality and reliability of the data generated by digital health companies? What standards are you measuring them against? Data quality management (DQM) is the way in which leading companies evaluate the quality and reliability of data sources. ISO 9000’s definition of quality is “the degree to which a set of inherent characteristics fulfills requirements.” At ZS, we have a very robust DQM methodology, and our definition goes beyond the basics to include both the accuracy and the value of the data. Factors such as accuracy and absence of errors, and fulfilling specifications (business rules, designs, etc. ), are foundational, but in our experience it’s most important to also include an assessment of value, completeness, and lack of bias because often these factors can lead to misleading or inaccurate insights from analysis of that data. However, it’s not easy assessing the value of a new data source, which presents an entirely different set of challenges. One very important one is the actual interpretation of the data that’s being collected. How do you know when someone is shaking their phone or Fitbit to inflate their steps, or how do you interpret that the device has been taken off and it’s not tracking activity? How do you account for that and go beyond the data to understand what is really happening? As we get more experience with IOT devices and algorithms get smarter, we will get better at interpreting what these devices are collecting and be more forgiving of underlying data quality. What are the ethical implications or issues (such as data ownership, privacy, and bias) you’ve encountered thus far, or anticipate encountering in the near future? The ethical stewardship and protection of personal health data are just as essential for the long-term sustainability of the digital health industry as the data itself. The key question is, how can the industry realize the full value from this data without crossing the line? Protecting personal data in an increasingly digitized world—where we’ve largely become apathetic to the ubiquitous “terms and conditions” agreements—is a non-negotiable. How digital health and life science companies collect, manage, and protect users’ information will remain a big concern. There are also ethical issues around what the data that is captured is used for. Companies need to carefully establish how to appropriately leverage the data without crossing the line. For example, using de-identified data for research purposes with the goal of improving products or services is aligned with creating a better experience for the patient, as opposed to leveraging the data for targeted marketing purposes. Companies also face the issue of potential biases that may emerge when introducing AI and machine learning into decision-making processes around treatment or access to care. Statistical models are only as good as the data that are used to train them. Companies introducing these models need to test datasets and their AI model outputs to ensure gaps are eliminated from training data, the algorithms don’t learn to introduce bias, and they establish a process for evaluating bias as the models continue to learn and evolve. (How) does it all connect? When browsing the Internet for answers, one notices quickly that others too are struggling to understand how it all works together. 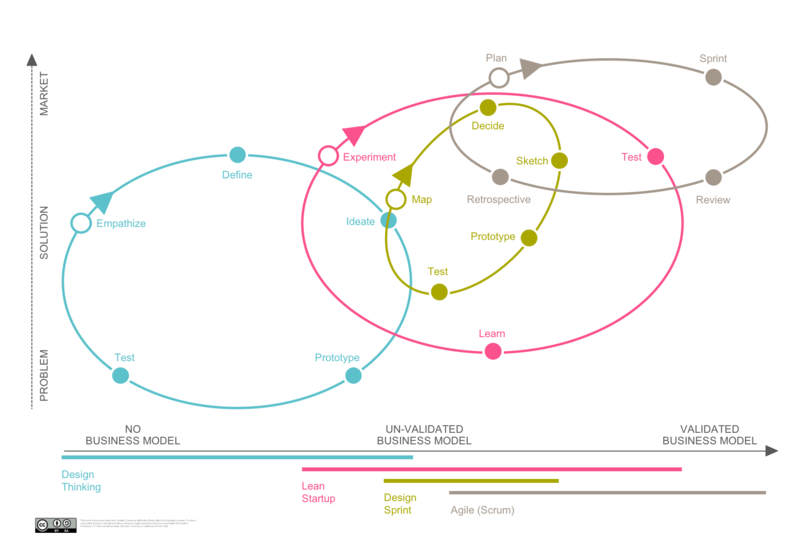 Gartner (as well as numerous others) tried to visualise how methodologies like Design Thinking, Lean, Design Sprint and Agile flow nicely from one to the next. Most of these visualisations have a number of nicely coloured and connected circles, but for me they seem to miss the mark. The place where one methodology flows into the next is very debatable, because there are too many similar techniques and there is just too much overlap. It probably makes more sense to just look at Design Thinking, Lean, Design Sprint & Agile as a bunch of tools and techniques in one’s toolbox, rather than argue for one over the other, because they can all add value somewhere on the innovation spectrum. Innovation initiatives can range from exploring an abstract problem space, to experimenting with a number of solutions, before continuously improving a very concrete solution in a specific market space. An aspect which often seems to be omitted, is the business model maturity axis. For established products as well as adjacent ones (think McKinsey’s Horizon 1 and 2), the business models are often very well understood. For startups and disruptive innovations within an established business however, the business model will need to be validated through experiments. Design Thinking really shines when we need to better understand the problem space and identify the early adopters. There are various flavors of design thinking, but they all sort of follow the double-diamond flow. Simplistically the first diamond starts by diverging and gathering lots of insights through talking to our target stakeholders, followed by converging through clustering these insights and identifying key pain-points, problems or jobs to be done. The second diamond starts by a diverging exercise to ideate a large number of potential solutions before prototyping and testing the most promising ideas. Design Thinking is mainly focussed on qualitative rather than quantitative insights. The slight difference with Design Thinking is that the entrepreneur (or intrapreneur) often already has a good understanding of the problem space. Lean considers everything to be a hypothesis or assumption until validated …so even that good understanding of the problem space is just an assumption. Lean tends to starts by specifying your assumptions on a customer focussed (lean) canvas and then prioritizing and validating the assumptions according to highest risk for the entire product. The process to validate assumptions is creating an experiment (build), testing it (measure) and learn whether our assumption or hypothesis still stands. Lean uses qualitative insights early on but later forces you to define actionable quantitative data to measure how effective the solution addresses the problem and whether the growth strategy is on track. 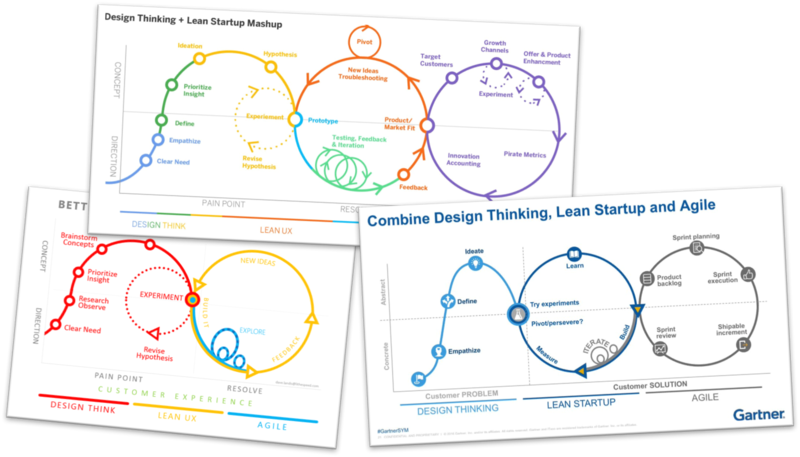 The “Get out of the building” phrase is often associated with Lean Startup, but the same principle of reaching out the customers obviously also counts for Design Thinking (… and Design Sprint … and Agile). It appears that the Google Venture-style Design Sprint method could have its roots from a technique described in the Lean UX book. The key strength of a Design Sprint is to share insights, ideate, prototype and test a concept all in a 5-day sprint. Given the short timeframe, Design Sprints only focus on part of the solution, but it’s an excellent way to learn really quickly if you are on the right track or not. Just like dealing with the uncertainty of our problem, solution and market assumptions, agile development is a great way to cope with uncertainty in product development. No need to specify every detail of a product up-front, because here too there are plenty of assumptions and uncertainty. Agile is a great way to build-measure-learn and validate assumptions whilst creating a Minimum Viable Product in Lean Startup parlance. We should define and prioritize a backlog of value to be delivered and work in short sprints, delivering and testing the value as part of each sprint. Probably not really the answer you were looking for, but there is no clear rule on when to start where. There is also no obvious handover point because there is just too much overlap, and this significant overlap could be the explanation of why some people claim methodology <x> is better than <y>. Anyhow, most innovation methodologies can add great value and it’s really up to the team to decide where to start and when to apply which methods and techniques. The common ground most can agree with, is to avoid falling in love with your own solution and listen to qualitative as well as quantitative customer feedback. As designers, we want to work on problems that are intriguing and “game-changing”. All too often, we limit the “game-changing” category to a handful of consumer-facing mobile apps and social networks. The truth is: enterprise software gives designers a unique set of complex problems to solve. 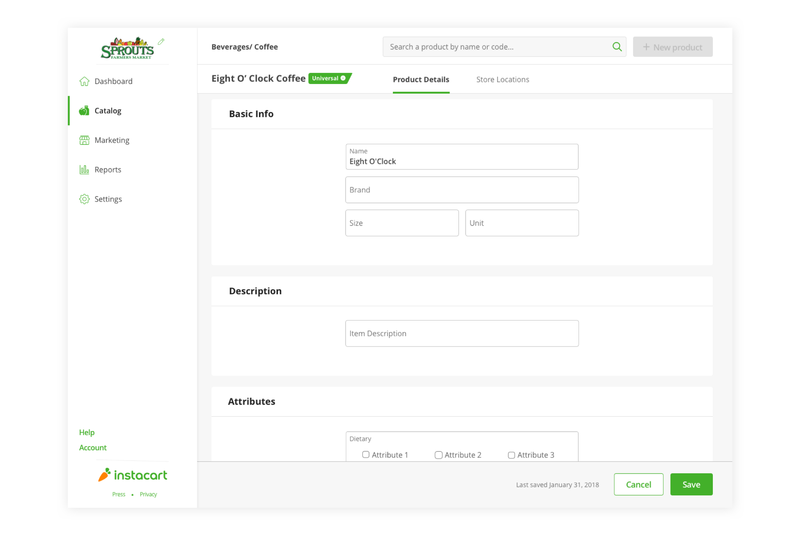 Enterprise platforms usually have a savvy set of users with very specific needs — needs that, when addressed, often affect a business’s bottom line. The greater the complexity, the greater the opportunity to find elegance. 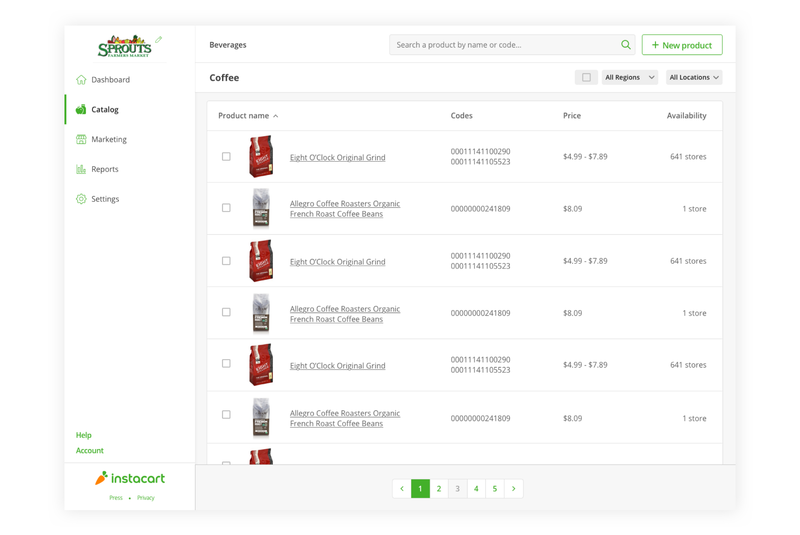 As we scoped the project we found that the existing product wasn’t enabling retailers to manage their inventories as concisely and efficiently as they could. 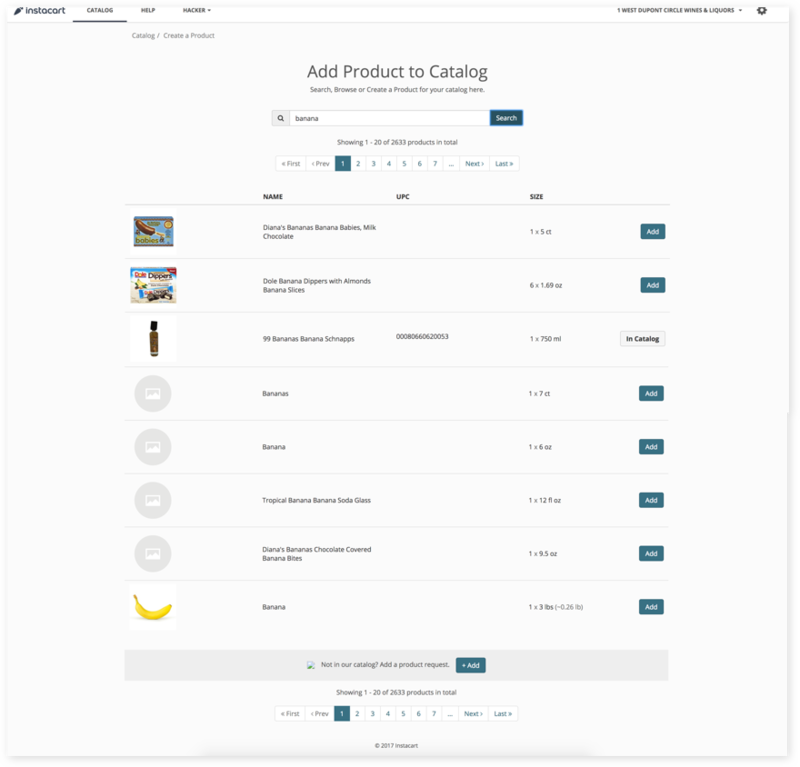 We found retailer users were relying on customer support to help carry out smaller tasks. 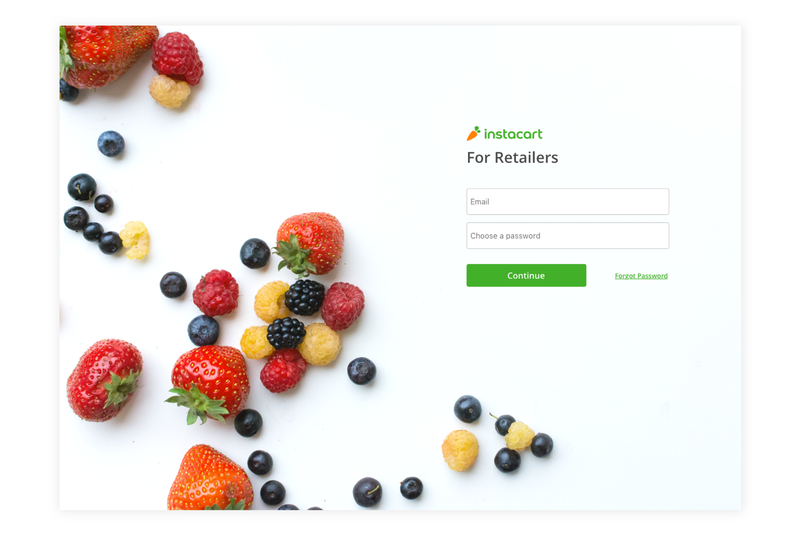 Our goal with the redesign was to build and deliver a better experience that would enable retailers to manage their inventory more easily and grow their business with Instacart. 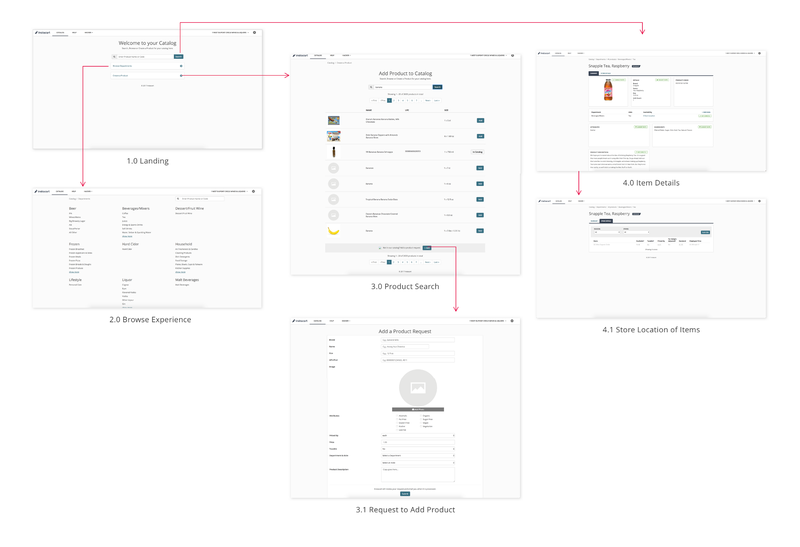 The first step in redesigning was to understand the flow of the current product. We mapped out the journey of a partner going through the tool and spoke with the PMs to figure out what we could incorporate into the roadmap. New Departments page for the Partner Tool. 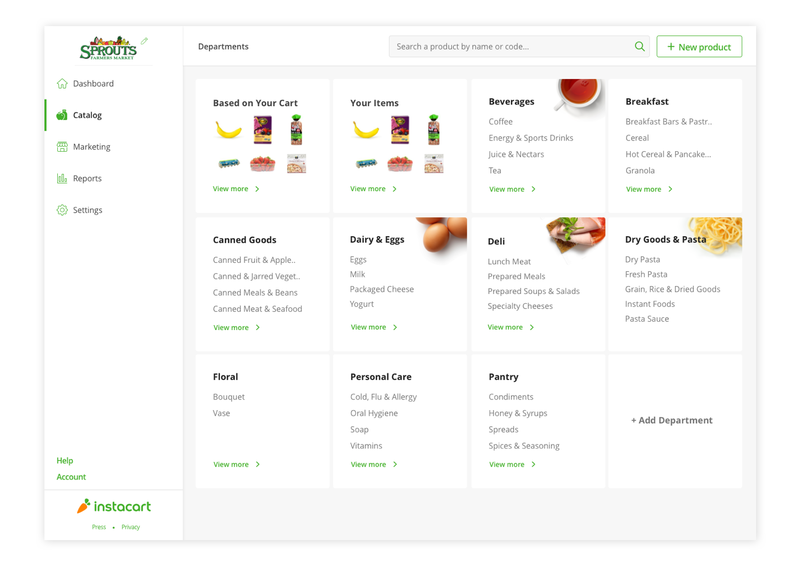 Responsive tiles allow partners to view and edit their Aisles and Departments quickly. Sources now pop up on the top right of the input fields so the editor knows who last made changes. Seeking validation through numbers is always fantastic. 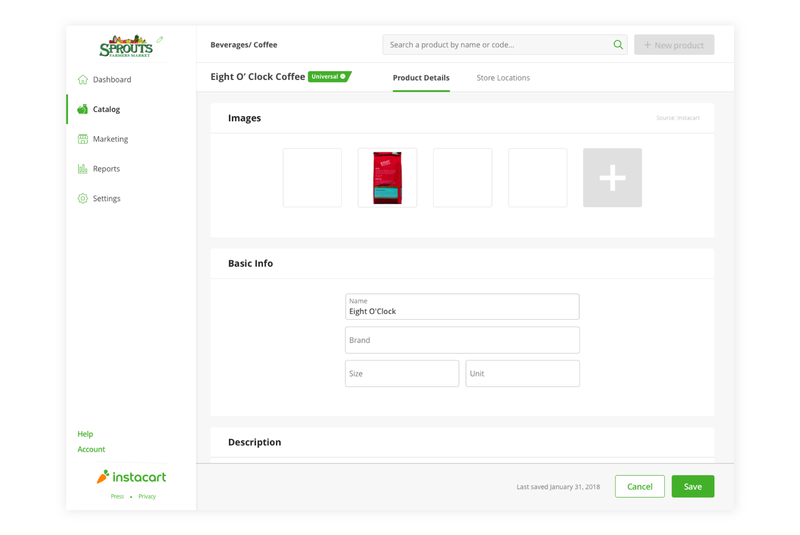 We did a small beta launch of this product and saw an increase in weekly engagement and decrease in support requests.